There are times when you struggle to navigate your customer to the office, especially when it is located in an obscure building somewhere inside suburbs. You may start to tell your customer the direction on phone. But in such situation, the best way is to opt for Google Street View. Google Street View – the technology is used for panoramic views of streets and buildings around the world. This feature was created by Google as an extension for Google Maps and available for mobile app developers via a dedicated SDK (software development kit). You can integrate Street View in your iOS apps as a feature. Travel Industry – obviously, there are many hostels hiding inside suburbs across the world. Sport & Fitness – the feature allows you to display and animate run routes. eCommerce & Food Delivery – can be applied for internal use in order to navigate couriers across the city. Testing and tweaking Google Street View. Note: The demo was written in Swift and tested on Xcode 8.3. To get started with Street View, let’s first create a test project with minimal configurations. 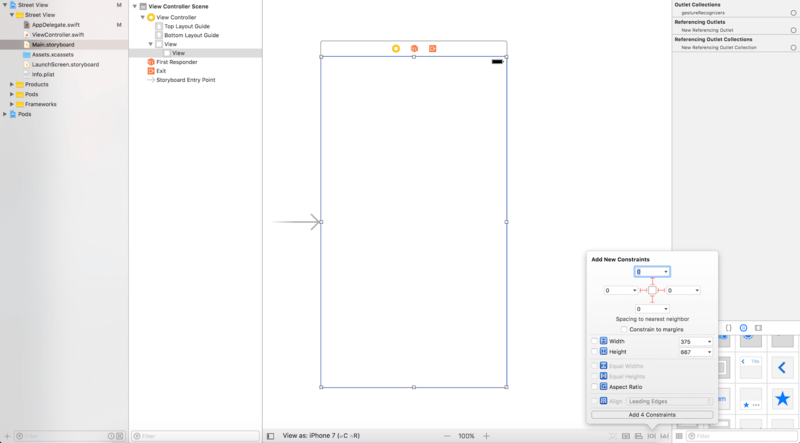 Fire up Xcode and create a new project using the Single View Application template. Name the project Street View (or whatever name you like). Editor’s note: If you do not have any experience with CocoaPods, you can check out our beginner guide on CocoaPods. 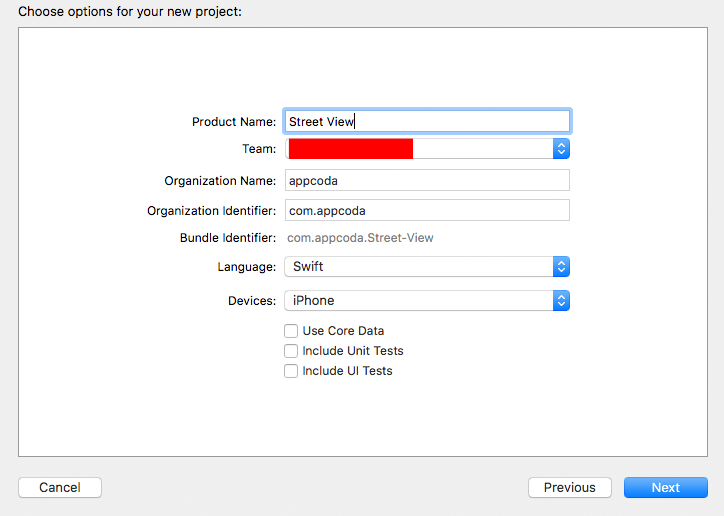 If everything works great, you should have Google Maps bundle in your Xcode project. We are now ready to implement Google Street View in the app. Open Street View.xcworkspace to get started! 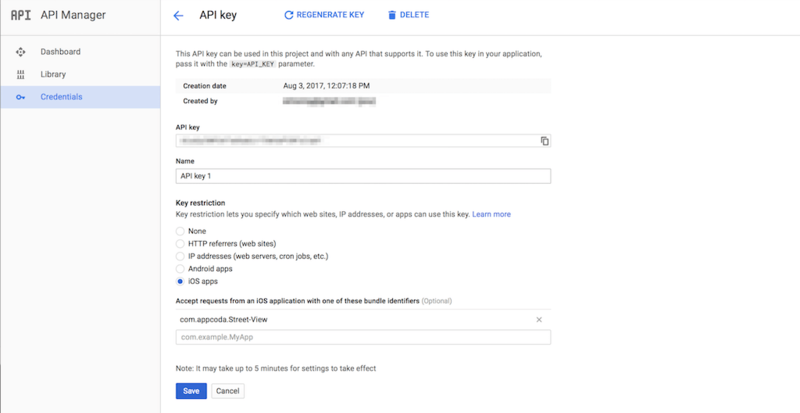 Now, you’ll need to get an API key, so your app could communicate with Google Maps service. First, go to https://console.developers.google.com, and create a new project. I name it StreetViewAppCoda. You can just pick another name if you like. Next, open your fresh made project. Next, we need to register our application in Google for using the Google Maps SDK. Go to the Library tab and select Google Maps SDK for iOS. Now go to the Credentials tab. 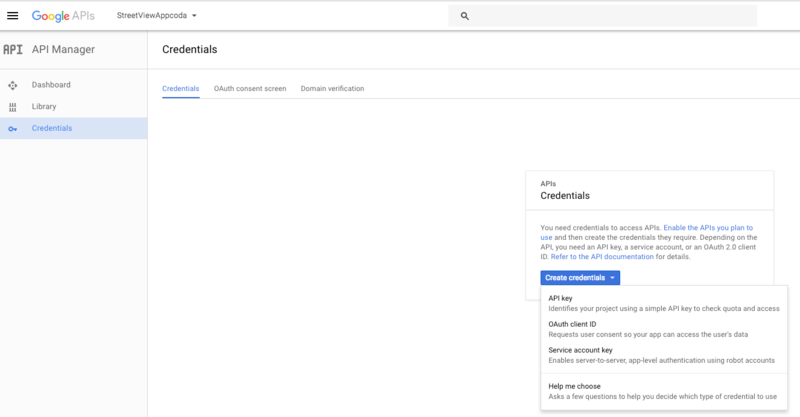 Click “Create Credentials” and choose “API key” to create your own API key. Then, go to API key settings, and click the Edit icon. Here you will need to limit the API key to our demo app only. 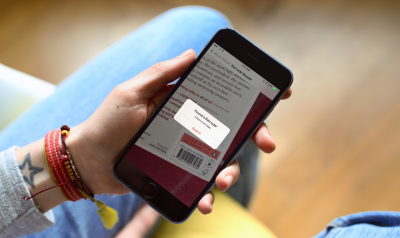 Choose iOS app in the key restriction section, and enter the bundle ID of your app (e.g. com.appcoda.Street-View). Save it. You made it! You can now access Google Maps service from your demo app. 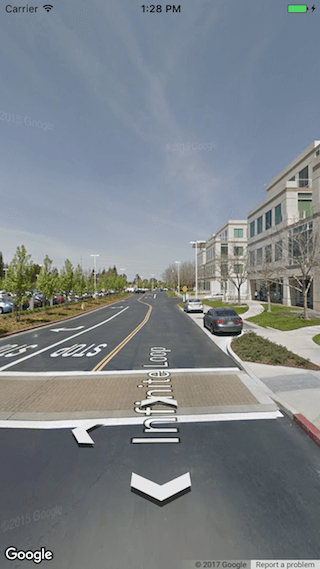 It’s time to return Xcode and code our demo app for Google Street View. Now we need to place our panorama (Street View) on the screen. Go to Main.storyboard and add a view to the view controller. This view is used to display the street view, provided by the Google Maps SDK. In order to make it fit for all screen sizes, add a few layout constraints as shown below. To enable street view for this view, select it and go to the Identity inspector. Change its class from UIView to GMSPanoramaView. The view is ready. The last thing is to connect it with the code. Switch to assistant editor. Control drag from the view to ViewController.swift. Add an outlet named panoramaView. Also remember to insert the import GoogleMaps statement at the very beginning. Otherwise, you will get some errors. Now run the project to try it out. The demo app should show you the street view. Cool, right? However, you may want to turn the camera to face the exact building or spot. You can manually drag the view to achieve that, but how can we tweak the view position programmatically? This is what I am going to show you. By default, camera direction is set to 0. 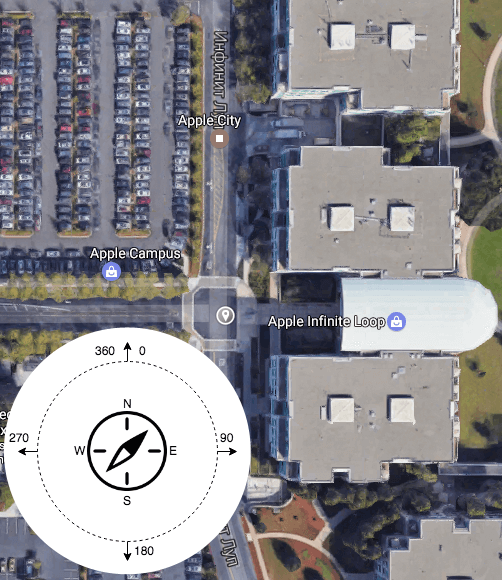 For example, if you want to turn the camera from the street to Apple’s office, you need to rotate by 90 degrees clockwise. For the pitch parameter, the image below should give you a better understanding. This is why we set its value to 0. Now you are ready to have a quick test. If you run the app in simulator, the view angle will change after the app is launched. 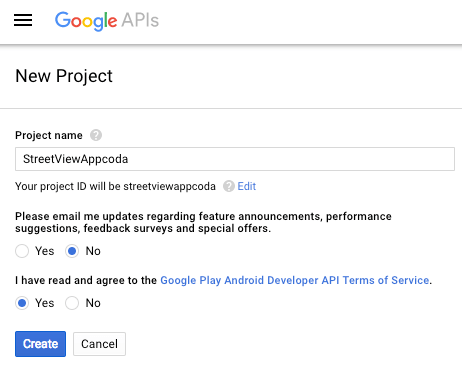 After loading the street view, you can adopt the protocol GMSPanoramaViewDelegate to capture any events such as panorama changes, user interactions, etc. One event you will need to handle is the error event. What if Google Maps doesn’t have street view for your specified coordinate? There are other configurations available for the panorama view. You can refer to the Google Maps SDK for iOS for details. While the feature is available from standalone Google Maps application almost on every mobile device, putting Street View directly into your app may increase the average usage time and user engagement rate. Keep in mind that Google Street View comes with many cool features and methods that allow developer to go beyond the simple panoramic view. 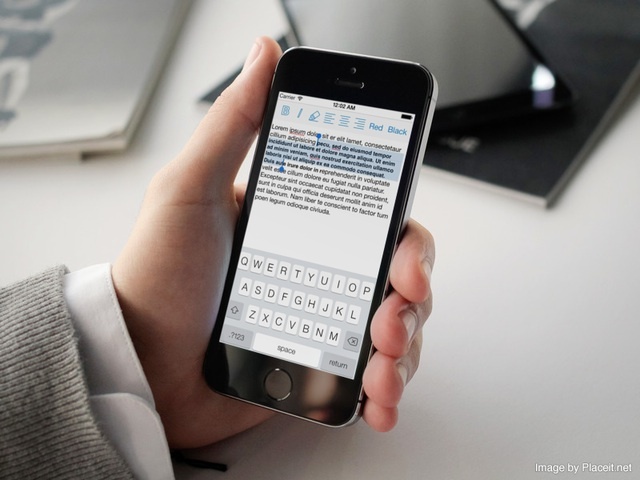 For instance, you can connect gyro to the panorama, so the user could turn the view by moving his phone. 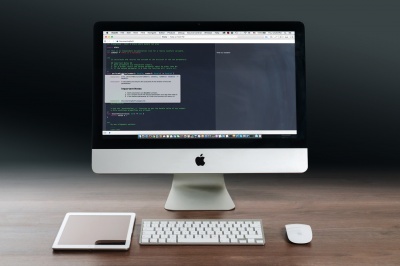 This is a guest tutorial written by Andrew Zakhliupanyi, an iOS developer at GBKSOFT, an outsourcing web and mobile development company. Andrew is an iOS developer that loves to build great apps and create juicy features. Credit: Photo by Hans M on Unsplash.